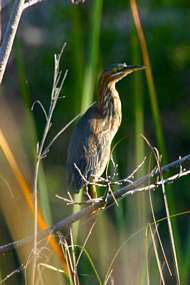 Equally accessible from the East and West Coasts of South Florida, Turner River Road offers superior birding and wildlife viewing. For 21 miles Turner River Road cuts directly North through Big Cypress National Preserve, a Federal land holding of 729,000 acres of cypress strands, wet prairies, and pinelands. Running alongside is its benefactor, the Turner River Road canal, whose sand, shell and rock dredgings initially formed the road. Straight as an arrow, seemingly an endless bed of crushed rock and sand a few feet above water level and extending north of Interstate 75, it takes visitor traffic from the Tamiami Trail and diverts it deeper into the Everglades. Basically a one-way-in, one-way-out route, the roadway has become a great viewing platform for the wildlife activities along the canal. It was in the late 1950s that dredge operators, oilers and other heavy equipment specialists converged near the Turner River and began to dig the now infamous canal there. The man-made waterway was designed to drain some of the cheap swampy terrain north of the Tamiami Trail and turn it into expensive, "high and dry" real estate. Developers, recognizing the opportunity to cash in on America's great migration to Florida, planned residential home sites in the then-drained swamplands of the Everglades interior. Ecologically calamitous events were mostly unrecognizable in those days and so the damage to this area was not understood for decades - that the Turner River would become shallow, slow-moving and clogged with vegetation as well as the unfavorable alteration of the ecology along the river and estuarine areas at the outflow of the river in Chokoloskee Bay. Poor sales ended the local development of this area and in 1980 conservationists and wildlife officials developed a plan to restore what was then acknowledged as an ecologically damaged landscape. A system of dams and culverts were subsequently placed into the canal to slow and redirect the water flow into the drained areas and the canal south of the Tamiami Trail was blocked and filled. These measures greatly assisted the area's return to normalcy and today the Turner River Road canal is essentially a series of connected ponds attracting and sustaining a variety of wildlife. The H. P. Williams Roadside Park denotes the most southerly point of the Turner River Road at its intersection with the Tamiami Trail (US Highway 41). This picnic area is in a scenic setting with a small pond, boardwalk and trees. The road here is paved but soon turns to crushed rock and sand. In drier times the road and its surroundings can become very dusty and in rainy season there are mucky places to avoid. Since there is only one exit about one-third of the way in, the wide, 2-lane road easily accommodates all entering and exiting traffic and, outside of some washboard surfaces, is good enough to travel in the family car. The canal runs directly along the road almost to the very end near Bear Island. Except for some areas where the vegetation blocks direct sight, there is great viewing for all passengers from the interior of most vehicles. During the Fall, Winter and Spring wildlife can be abundant. This writer has counted over 100 alligators in the water or sunning on the shore during a single pass (Winter, 2006). While guarantees of wildlife sightings at any particular location in Florida can't be made, those looking for the best chances of finding, viewing and taking pictures of birds and animals in the wild will find no better site. Many species of wading birds favor this location including little green, tricolored, great blue, and little blue heron; great and snowy egret; white and glossy ibis and wood stork. Anhingas and double-crested cormorants are frequently seen in the water or in the trees. Common moorhen, pied-billed grebe and common loon will be found paddling throughout the length of the system. Testament to the efforts of conservationists, it is not uncommon to see flocks of 20 to 50 same-species birds feeding along the canal. Apparently, due to many breeding areas nearby, this is also an outstanding location in the winter to see a variety of wading birds in their most attractive plumages and view adolescent birds and behavior. While the big birds and alligators are counted in the largest numbers along this 21-mile wildlife drive through several Florida ecosystems, white-tailed deer are common as well as wild pigs, raccoons, river otter and bobcat. Even the endangered Florida panther is spotted here on occasion, befitting because Big Cypress is part of its territorial range. For those with 4-wheel drive or off-road vehicles, a permit may be obtained at the Big Cypress National Preserve Visitor Center on US 41 East of Turner River Road to access some of the many gated trails that branch off of Turner River Road. In this way hundreds of miles of vehicle trails deep within the Everglades can be explored. Two other scenic roadways - Birdon Road and Wagonwheel Drive - are in the same locale as Turner River Road and offer similar wildlife viewing opportunities. Both are graded rock and sand roads and have canals running alongside. At the far end of Turner River Road, Bear Island campgrounds allows tenting and RV's in unimproved settings. Hunting is allowed in season and is tightly regulated by the State of Florida. Turner River Road is located in Southern Collier County approximately 6 miles East of the intersection of Florida State Road 29 and US Highway 41 (Tamiami Trail). Nearby is the Turner River, a favorite of canoeists and kayakers. Copeland, Florida would be the nearest city and a side trip to Everglades City for lunch or dinner is less than 15 minutes away. An early morning or early evening drive along the road is thought to provide the best opportunities for viewing. As always, when viewing wildlife, keep a safe distance and resist the urge to feed them. Care should be taken at Turner River Road when leaving your vehicle for a close up picture or viewing of alligators as they often bask in the sun on the western shore of the canal (the road side) and can easily be hidden in the brush. While they will retreat when you get too close, if you don't see them, it can be quite a fright when 200-300 pounds of alligator hits the water near you!